I see demotions. And that fow looks so smooth. As cool as the FoW looks, it kinda defeats the whole purpose of FoW. I'd think Yeti just haven't coded that part yet. It'd be pretty neat if you could do a similar lighting-trick with light sources in the maps, like torches or firepits, or even around cities (darkening away from buildings). Like, make a slightly brighter, flame-tinted aura or something. But I thought people turned white when they get stabbed. Will people catch on fire too? And how will cavaliers react when they get stabbed in the nuts? Incredibly awesome. Thanks for making me even more excited. Jerk. I can't wait to see all the animations. I weep for them. Honestly, I do. Why would you turn off animations on anything Yeti works on? I feel sorry for them too. Is there gonna be a turbo button tho? But really, the turbo buttons addicting, and the game's more fun without it. I'd need a setting to turn it off, if there is one. 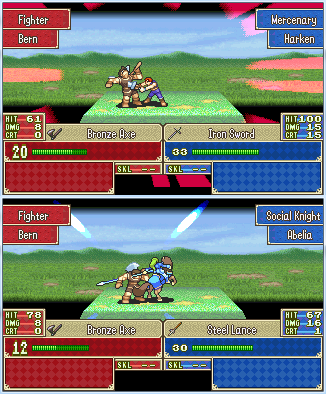 Perhaps they could add phase skipping like in FE11 and 12 where if you pushed start during the enemy phase it would skip completely. 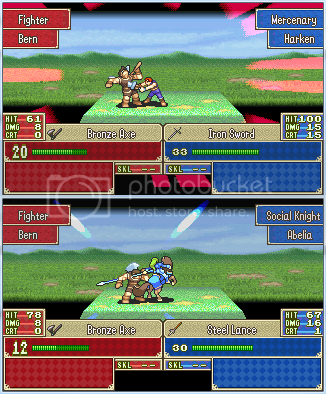 As I brought up on the FE7x forum, the poses of the fighter do not really make sense with the way he is being attacked. The cavalier is stabbing him yet he appears to be crouching and the mercenary is coming from above so you'd think the fighter would be crouching from taking a blow to the head, not spread out as if he's been stabbed/hit front-on with a lot of force. Though what I am saying may be completely unnecessary as I do not know what is looks animated, nor do I know how you are doing it. Maybe every class has an x amount of hit poses that happen at random instead of a specific hit pose for how they're hit. Why would you turn off animations on any Super Robot Wars game? I feel sorry for them too. Oh wait no I don't because strategy games take over twice as long with all animations on. In my opinion, the best way to include an animations on/off thing would be to allow people to decide before each battle whether they want to watch the animation, like in Super Robot Wars, though having another screen before every battle could be annoying. Maybe dedicate a button to turning animations on/off at any point or allowing you to skip animations by pressing start like in the DS FEs? I've never played FE7x, so I did not know that. Maybe dedicate a button to turning animations on/off at any point or allowing you to skip animations by pressing start like in the DS FEs? They didn't at first to me either, but now they make sense. The mercenary attack involves his sword slicing down, which would strike the fighter in the head/shoulders. If the fighter was leaning even slightly back, the strike would push his entire torso back instead of forwards. And I so the fighter as more being stabbed in the stomach than the head, which would make crouching make sense. Even if it was in the chest, which is what it looks like the strike is coming from above, so it might push the body part it's striking downwards.